Time to test the legs again following Country to Capital and I picked Rushmere parkrun out of the virtual hat for somewhere to visit while Other Dan recovers from a foot injury. Rushmere Country Park is located at Leighton Buzzard and is managed by the Greensand Trust on a not for profit basis. The Greensand Trust manages this area comprising Rushmere (200 acres), Stockgrove (80 acres), Oak Wood (100 acres) and Rammamere and parts of Kings Wood. Stockgrove was opened to the public in 1972 and Rushmere is the newest addition to the Estate, opened in 2011. I drove to Rushmere Country Park and there is ample parking near the start/finish area with a standard £2 payment that covers all day, which is paid on exit at the barrier machines. The parkrun course page indicates that the nearest train station is Leighton Buzzard, which is a three-mile walk from Rushmere Country Park. Leighton Buzzard station is served by National Rail services from London Euston and Birmingham/Northampton. The majority of runners were car sharing but there were also cyclists who were leaving their bikes around the start/finish area. I didn’t specifically check for bike racks but the the site itself has plenty of off-road cycle trails so I am sure there are plenty of facilities to secure bikes. It’s a two lap course consisting of woodland trails that were extremely muddy when I visited in January. The run starts along a firmer section that bunches up the runners and because of the wet conditions the start of the course was narrower because most of the runners were circumnavigating the puddles by sticking to the edges. I steamed through the puddles in the middle although did not consider the splashes this would cause for the runners around me so I generated a few *ahem* comments from the people nearby. I’m sure they saw the karma as we moved onto the first sections of deep mud and had the chance to laugh as one of my shoes was swallowed by the quagmire, which left me striding along with a sock sinking into the mess. Thankfully one of the runners behind was kind enough to rescue my shoe and hand it to me as he passed so I wasn’t caught hopping back through the crowd. 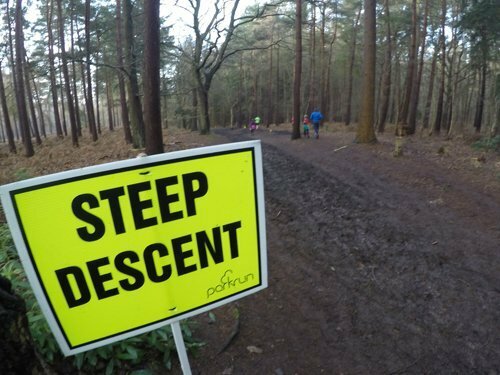 Next up (or actually down) was a steep hill that necessitated it’s own sign to warn runners of the steep descent. It’s a shame that my legs were still feeling tired from Country to Capital because I love a good eyeballs out steam down a muddy hill. I gave it my best but my quads were not happy with the slope and I know that my next visit is going to require a daring sprint down the hill. The bottom of the hill takes you past a lovely looking pond, well, I am sure that it will look lovely in the summer, and then the gradual up slopes that take you back to the start/finish area. I was happy enough taking stops for photo opportunities and was in no rush to record any particular time. Some runners passed me, I caught them back up, and we repeated our leap-frog around the second lap. This was a great parkrun location and course that I know will be revisited sometime in the future with Other Dan. 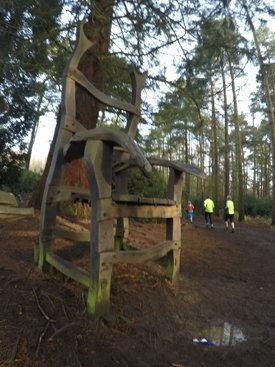 It reminded me of Black Park parkrun & Alice Holt parkrun; woodland trails, muddy sections, and hills to conquer. I would enjoy this as a home parkrun and I’m envious of the fab area that surrounds the parkrun. Unfortunately I didn’t have time to hang around for food & drink but the event pages states that the team go to the Tree Tops Café for a post-parkrun coffee.